Cheap Cruises From Miami - When and Where Can I Go? 3 day cruises from Miami can be had on MSC, Disney, Carnival, Norwegian or Royal Caribbean cruise lines and travel over to ports of call in the Bahamas, namely Nassau and the private islands like Castaway Cay, Half Moon Cay and Great Stirrup Cay that are exclusive to the lines that own them. Also featured on some itineraries are stops in Key West or Cape Canaveral, both fantastic ports of call without actually having to leave the United States. If a Bahamas cruise from Miami lasting a bit longer than just 3 nights is what you are after, check out Royal Caribbean’s 4 night outing to Nassau, Cococay and Key West, Norwegian’s 4 night trip to Grand Bahama Island, Nassau and Great Stirrup Cay, or Carnival’s 5 day jaunt to Nassau, Half Moon Cay and Grand Turk where the cruise port is a vacation destination in and of itself. 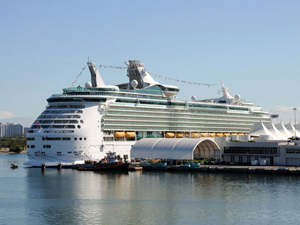 Cheap cruises from Miami that last a week or more include the weeklong trip on Celebrity that visits San Juan, Puerto Rico, Philipsburg and Basseterre or Norwegian’s 7 night outing to Philipsburg, St. Thomas and Nassau. Oceania’s 10-night escape that visits Key West, George Town, Cozumel, Belize, Santo Thomas, Roatan and Costa Maya takes you west as you take in the Gulf of Mexico and the culture of Mexico and Central America’s ports of call. If Cartagena, and places like Orenjestad Aruba, Willemstad Curacao, and St. Thomas in the USVI are calling, cheap cruises from Miami onboard Norwegian Cruise Lines can take you there in style. Jamaica and Mexico are packaged together along with Great Stirrup Cay on Norwegian’s 7-day trip cruises from Miami, taking you to two of the popular cruise destinations in the world where you can climb Dunn’s River Falls or bask on the pristine beaches while soaking up the rays and local flavors. With Miami being a gateway not only to the Bahamas but also to the Caribbean and Mexico as well, it is a great port to embark on your adventure from. Weekend cruises from Miami offer fabulous short stays aboard some of the world’s most exciting ships where the nightlife, activities and dining choices are plentiful, coupled with fun places to explore on your days off the ship. Cheap cruises from Miami leave year round from the colorful Florida port and offer you any length of vacation that you so desire.